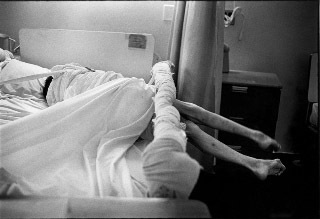 Patt Blue is a photographer known for her intense, long-term documentary projects and unflinching eye. 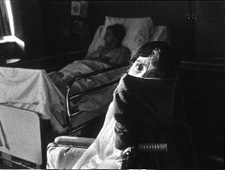 In the 1980′s, images from “Other People,€ her study of disabled residents at Goldwater Memorial Hospital, were published in LIFE Magazine and recognized by the Leica Medal of Excellence for Humanistic Photography and a Robert F. Kennedy Journalism Citation, among many honors. 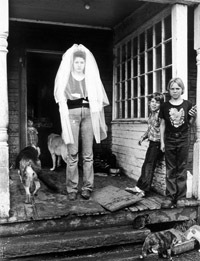 Other bodies of work include “How Far Is Heaven,€ about the culture of poverty in a rural family of twelve; “Heart of Man,€ depicting the struggle between the corporeal and the spiritual for male figures; and “Biologically Yours,€ a study of teen mothers facing pregnancy and surrendering their babies on their own. 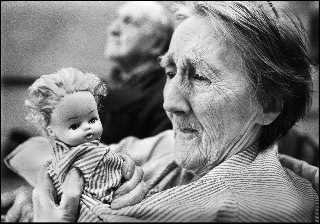 In “Facetime,€ Blue documents her own aging, and “Torn Wing€ expresses homelessness of heart, mind and body through photographs and writing. Blue is also a challenging and imaginative photographic educator who has taught at the International Center of Photography, New York University, Moore College of Art, and Kean University. She is currently on the faculty of Evergreen State College. 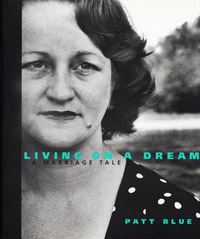 Her 1998 memoir, Living On A Dream: A Marriage Tale, portrays her parents’ tortured relationship through her father’s photographs and interviews with her mother. It won the Golden Light Award for Best Personal Essay and received four stars from Publisher’s Weekly. She is a special photographer, with toughness, courage and heart. Tell us about the woman photographer who inspired you most. PB: I met Ruth Orkin in the late 70s at ICP where I was on the faculty and Coordinator of Darkroom Programs. Ruth was a constant figure at the massive openings, though I didn’t know at the time she was a great photographer. Ruth was a talker and didn’t mind getting right to what was on her mind. At that time it was Cancer. I would say, “Ruth, what are you doing here?€ I thought an opening would not be so very important if I were battling cancer, but Ruth would brush it off: “But what can I do? I love being here!€ Though she was on a survival path, she was upbeat and embraced the world as a friendly place. I felt the world to be a fearful and insecure place that I had to conquer. Ruth was a marvel for me because she had a positive personality without the angst and edge. She raised my awareness of how to enjoy the challenges. Although we were as different as night and day, mirrors and windows, it was because of this difference that I learned from Ruth. 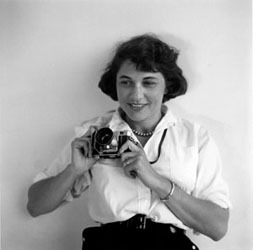 PB:Ruth Orkin, 1921-1985, was a self-made working photographer who first made her way knocking on doors taking baby pictures, then entered the man’s world of photojournalism, making great classic, unforgettable photographs of people. 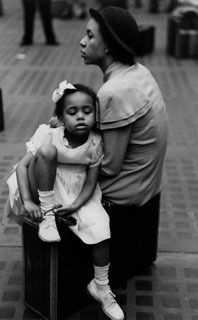 In the New York of the 1940′s, as a woman photographer, she was way ahead of her time. Ruth was so unpretentious and open, that not many of us younger photographers truly knew her history as a photojournalist. We hadn’t seen her iconic images of the “American Girl In Italy€ series, the Hollywood film stars, the New York stage and music world. At this time in the 70′s, she was making photographs of Central Park from her window using color film-her way of continuing to photograph while taking care of her children at home. She knew the thinking about a woman at home: “They think I’m this housewife that photographs out her window, but they don’t know that I have a whole body of work.€ Harper & Row published The World Through My Window in 1978. Ruth says she chose photography as a practical choice from her four passions: travel, music, film and photography. Unlike Ruth, I naively never considered photography a livelihood; it was driven by an inner necessity for social change. But I was in awe of Ruth’s attitude: a way-ahead-of-her-time woman photographer in the 1930′s and 40′s who thought photography was a way to earn a living. This was a novel idea for a woman of her day. Ruth used all her personal life experience to make her way. As a musician, she easily moved in the music world of New York and Tanglewood; as the daughter of silent-film actress Mary Ruby, she felt comfortable in the world of Hollywood with stars like Ava Gardner, Marlon Brando and Woody Allen. Ruth was Jewish and found her way to Israel, making some of her great images of women as she traveled alone around Europe. 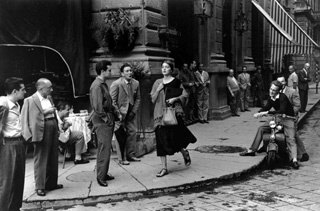 Her photographic series of Jinx Allen, “American Girl in Italy,€ 1951, has become world-renowned. Ruth says she first experienced discrimination not as a photojournalist, but when she wanted to be a cinematographer and women weren’t allowed to join the union. Now that I’m at the age Ruth was back then, I’m just becoming aware of the discrimination. Because Ruth and I shared an optimistic “anything is possible€ attitude as working photographers, I wondered if she like I, might have been blind to discrimination. Harold Evans once told me I was too fragile to work for The London Sunday Times, and I was told I was not aggressive enough to cover famine in Ethiopia. When I showed my Goldwater Hospital work to Cornell Capa, he advised charmingly, “Blue, can’t you do anything else?€ Later he surprised me with an apology and asked me to lecture. This I believe is the character of a great man. Like Ruth, who found a way to make photographs in A World Through My Window while raising children and editing films in her apartment, I found a way to make photographs while teaching full time and writing Living On A Dream, tethered to a computer. During this time I began my aging series, “Facetime,€ which is now in its 20th year. Ruth Orkin’s photographs were included in the Young Photographers show (1950) and the landmark Family of Man exhibit (1955) at the Museum of Modern Art. The greatest exposure of Ruth’s work has come posthumously thanks to her daughter, Mary Engel, who lovingly handles the Ruth Orkin Photo Archive. When Ruth finally passed away after an 18 year fight with breast cancer, Mary organized a memorial tribute at the Ethical Cultural Center in Manhattan where Leonard Bernstein and Isaac Stern performed. In 1995, ICP held a retrospective. Her photographs are now on exhibit in The Radical Camera: New York’s Photo League at The Jewish Museum in New York. In 2006, Engel founded the Orkin/Engel Film and Photo Archive to perpetuate the work of both her parents, Ruth Orkin and Morris Engel. She is also the founder of the American Photography Archives Group, a organization for individuals who own or manage a privately held photography archive, usually the work of a family member.